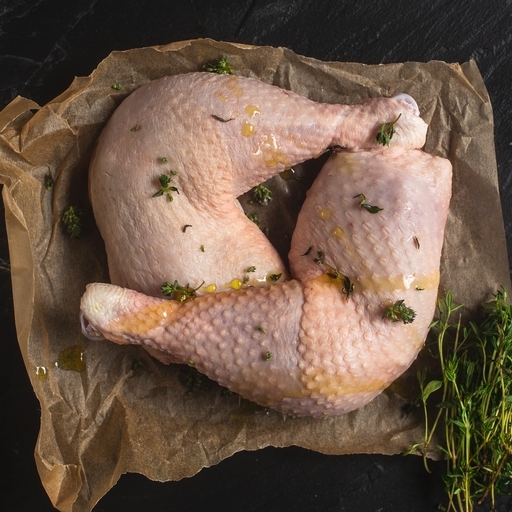 We trim our organic chicken legs carefully by hand in our own butchery, so they’re ready to cook – no prep needed. Fantastic marinated in spices then sizzled on the grill or barbeque. Our chickens are truly free range and organic, spending their time grazing outdoors, resulting in tender meat full of natural flavour. Serves 2-4. Approximately 2 chicken legs per pack. Leg meat is arguably tastier than breast meat but requires more cooking time to tenderize. Season, oil and roast at 200˚C/Gas 6 for 15-20 mins, until the skin has started to colour nicely. Drop the heat to 180˚C/Gas 4 and cook for a further 30 mins, at least. They like a bit of water, wine or stock in the tray to help them along, and are cooked when the meat easily separates from the bone.